I know what you’re thinking, “I have to tip?! But i’m already spending half of my life savings and then my coveted tax return.” Yeah I know, weddings are expensive, but you still have to tip. As Cardi B would say, it’s the right thing to do. The good thing is any planner you’re working with or info sheet you’re referencing should tell you to save some money in your budget for the tips. Depending on your wedding, this could be anywhere from $500-$1,000. The question now, is how to allocate that money. The good thing is I have a FREE, Downloadable Tipping Cheat Sheet you can use instead of continuously referencing this post, although feel free to do what you want. I break down percentages and allocations for every bit of your wedding! 2 - Check contracts for gratuities. Lots of times, your catering contract will already have the tip built in along with your floral contract. Don’t forget that slipping a tip to each set up person, chair delivery or cake delivery person will go a long way when it comes to service in the future or reviews. 3 - Every band member should get a tip, that includes the sound engineer! The head band member may own the company but each of the musicians did their best to provide amazing sound for you! 4 - If you’re getting married in a house of worship, most officiants will not take tips but rather a donation to the church will suffice. Check to see what their guidelines are when doing final run-throughs. Most importantly: Tipping is a measure of your gratitude for making your wedding day easy and stress free. 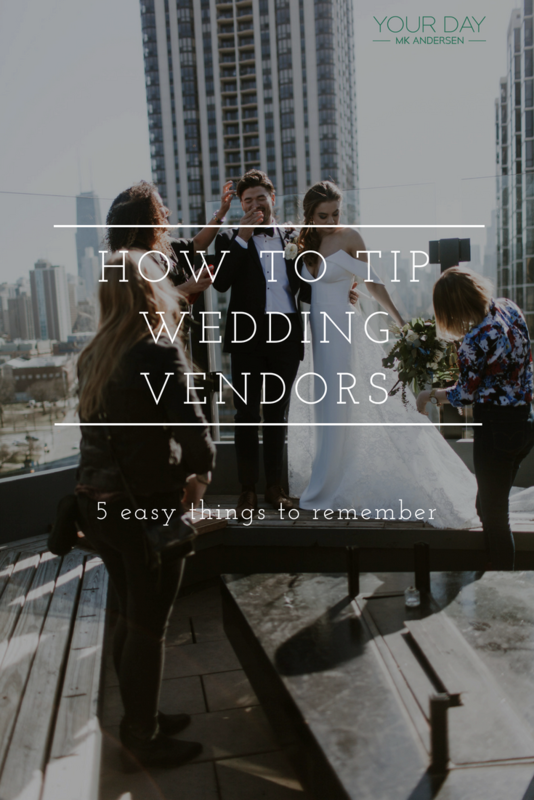 Without realizing it, many vendors go out of their way to make sure everything is perfect for you. We understand it is a big day in your life and thus will work accordingly! The appreciation is not forgotten. Pin the photo below to your wedding boards so you never forget These Tips!